I try to live a healthy lifestyle  choosing and preparing my food carefully and avoiding unhealthy foods. However, even the most careful person can accidentally put bad things into their body. Not too long ago I had an experience that really drove this truth home  and it all started with innocent looking, supposedly healthy oatmeal cookies. There I stood at the store, hungry for a snack. An apple pie looked tempting, but I knew that its hydrogenated fat content was a no-no. Then I spied an oatmeal cookie. Oatmeal is good for you, so it seemed like it was the perfect solution. Unfortunately, I was in for a shock. I chose my healthy oatmeal cookies, proudly showcasing their oat grains through occasional chocolate bits. A whopping 200 calories per cookie! If you are a woman living on 1500 calories diet, this is just unacceptable. But at least there was some oatmeal goodness in what I ate, some fiber, right? Right! 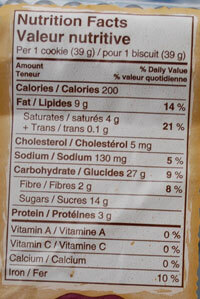 2 grams of fiber, 5% of the cookie's weight, were actually good for me. Accompanied by 5 mg of cholesterol. You just cannot win! Whats wrong with this picture? The proportion of the ingredients! Whether healthy or unhealthy, foods provide energy from protein, fats and carbs. Protein can be from animal or plant sources. Both carbs and fats can be of the good or bad variety. Healthy foods also include fiber (could be spelled "fibre"), unhealthy foods include cholesterol, chemicals, natural harmful substances and toxins. Protein and carbs produce 4 calories per gram, while fat supplies 9 calories per gram. Fiber doesnt supply calories, but plays an important role of internal cleanser and vehicle for the food to get from your mouth to its final destination. We need fiber to help digest food. Total: 28% of "GOOD" calories. What do we expect from healthy oatmeal cookies? 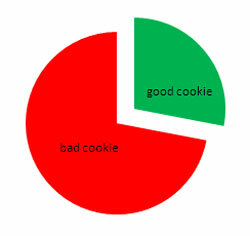 This cookie failed the test miserably. It turned out to be an artery-clogging, obesity and heart disease promoting 39 grams of little treat that many of us would easily buy for our children. By the age of 25, three out of four people living in the U.S. will have their arteries half-clogged with fats and cholesterol. Lets change this trend. We don't have to be a part of this statistics! Learning to read nutritional label is an essential skill to survive in the shopping jungle, yet nothing gives you more power over your own body than cooking by yourself and for yourself. 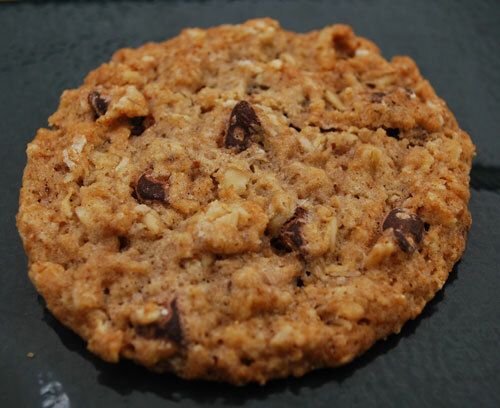 In the next article, I will share how you can make healthy oatmeal cookies using healthy nutritional ingredients as substitutes for unhealthy ones. Please check out Healthy and unhealthy food definiton and come back for more.